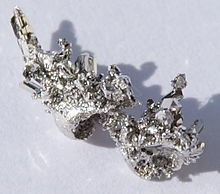 Palladium is a chemical element wi the chemical seembol Pd an an atomic nummer o 46. It is a rare an lustrous sillery-white metal discovered in 1803 bi William Hyde Wollaston. He named it efter the asteroid Pallas, that wis itsel named efter the epithet o the Greek goddess Athena, acquired bi her whan she slew Pallas. Palladium, platinum, rhodium, ruthenium, iridium an osmium fairm a group o elements referred tae as the platinum group metals (PGMs). Thae hae seemilar chemical properties, but palladium haes the lawest meltin pynt an is the least dense o thaim. Ower hauf o the supply o palladium an its congener platinum gangs intae catalytic converters, that convert up tae 90% o harmfu gases frae auto exhaust (hydrocarbons, carbon monoxide, an nitrogen dioxide) intae less-harmful substances (nitrogen, carbon dioxide an watter vapor). Palladium is uised in electronics, dentistry, medicine, hydrogen purification, chemical applications, groundwatter treatment an jewelry. Palladium plays a key role in the technology uised for fuel cells, that combine hydrogen an oxygen tae produce electricity, heat, an watter. Ore deposits o palladium an ither PGMs are rare, an the maist extensive deposits hae been foond in the norite belt o the Bushveld Igneous Complex coverin the Transvaal Basin in Sooth Africae, the Stillwatter Complex in Montana, Unitit States, the Thunder Bay Destrict o Ontario, Canadae, an the Norilsk Complex in Roushie. Recyclin is a soorce o palladium, maistly frae scrapped catalytic converters. The numerous applications an leemitit supply soorces o palladium result in the metal attractin considerable investment interest. This page wis last eeditit on 21 Dizember 2015, at 13:59.